For spraying plants to prevent ant or other insects from coming into your home try I Must Garden Insect Control! Test surface for staining and discoloring in an inconspicuous area. Clean surface well and remove any exposed food sources. Lightly spray troublesome areas, possible entryways, corners, and crevices. Repeat application in 2 days. After initial applications, reapply as needed to maintain control. Liberally spray around foundations and possible entry points to repel ants from entering. Repellent works best and lasts longest when it is applied to dry surfaces. Reapply as needed to maintain control. 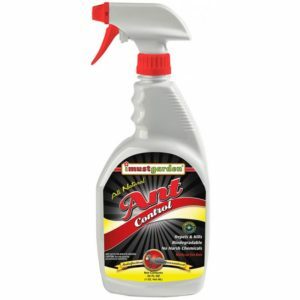 Spray directly on ants, or pour directly into ant mounds – drenching the soil thoroughly. For deeper or larger colonies, a repeat application may be necessary. For more information on the ingredients in the I Must Garden line of products products click here. 32 oz sprayer (coverage varies by use).